Submitted by Carlo on 2015-07-06 19:02. Area Contains 40 areas (8 exterior and 32 interior). 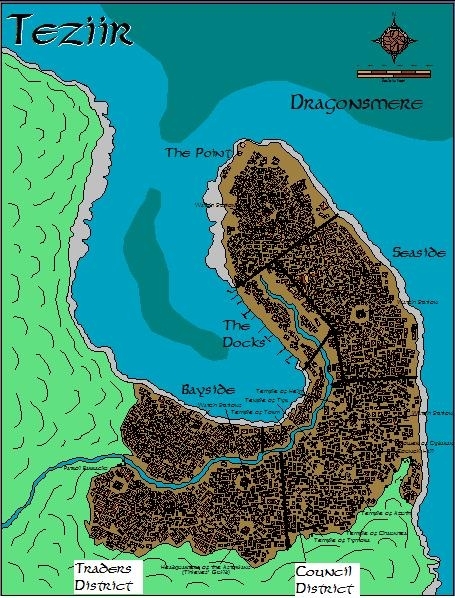 Teziir is an independent medium-sized city in the Forgotten Realms campaign setting. It is located on Faerun’s Dragon Coast and serves as an important trading center. The city is known for its rich ruling merchant council, a menacing thieves guild (the Astorians), a relatively large number of temples, not having any city walls, and occasional pirate raids. It is suitable for use either as an adventuring base for wilderness campaigns, or as the setting for city-based adventures. A minimal number of scripts, some key NPCs, and a small selection of pre-placed merchants are included, along with a city district map and regional map. Resources listed in the documentation include additional background materials on Teziir and suggestions for building and DMing. Download package (updated March 2019) contains a standalone module, an importable erf, documentation, and two maps. Please note that the module requires all official expansions and CEP 2.